The year is 2026 and fatal toxins have polluted the earth's atmosphere. Those humans lucky enough to get to the "Climate Emulation Centers" in time live in fear of the souls left on the surface - mutated, blood-thirsty zombies - the "undead." The World Government has recruited drivers to deal with this problem. 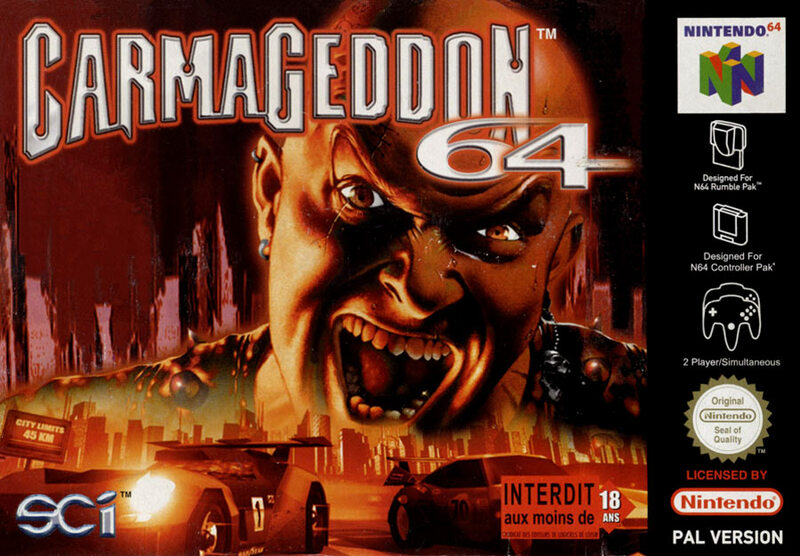 The solution is "The Carmageddon" - a death race in which drivers race against each other for the ultimate prize: a new life on the sun-drenched beaches of the off-world colonies. As well as a way of dealing with the zombies, it provides entertainment for the dwindling human population. You take on this challenge as Max Damage, a psychotic, cold-blooded racing machine. There is no second place. Drive to survive and let nothing and no one get in your way. 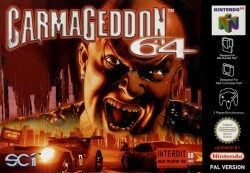 30+ levels, including new mission levels exclusive to the N64. 3 different 2-player game modes to thrash out including: Driven to Destruction, Checkout Stampede, and Eliminator. A feast of hidden power-ups. 23 Slaughtermobiles (even an ice cream van) including 3 hidden vehicles. Bonus pick-ups to upgrade your car's engine or armor throughout the game. Training Level to prepare beginners for the havoc and destruction ahead. ...bleibt noch hinzuzufügen das der Sound "grottig" ist. Das ist meine beste Einschätzung von diesem Titel. Wo ist der Kotz-Smiley??? Am PC ist das Game göttlich, vor allem im MP ( Erstauflage ). 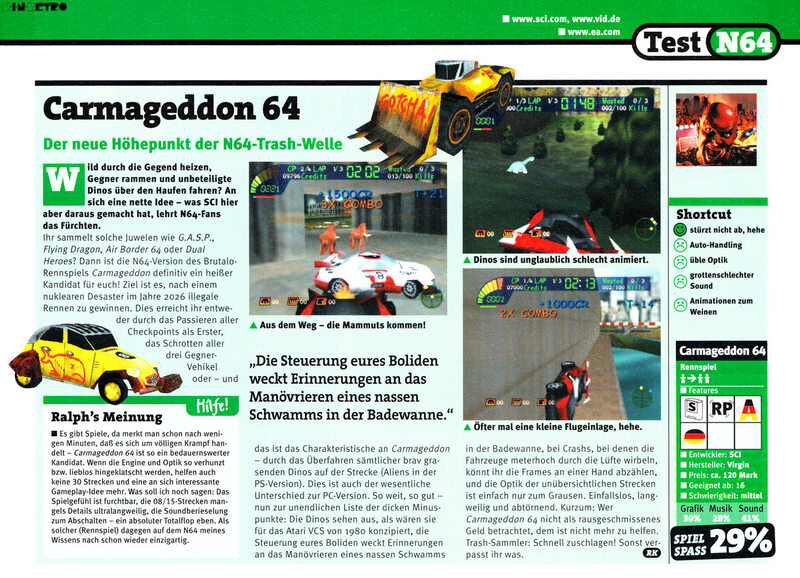 Die N64 Version is dagegen leider quasi unspielbar, dauerhaftes ruckeln macht das game zu einer Diashow. Zudem wurde es übel zensiert ( k, in den anderen versionen auch aber da war es keinerlei problem oder finanzieller mehraufwand es uncut zu spielen. Seite geladen in 0.414 Sek.